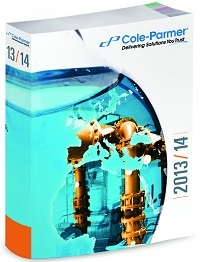 Cole-Parmer says its new 2013/14 Sourcebook offers the best of both for scientists, manufacturers, and purchasing managers. From conversion factors to regulatory agencies and approvals to selection guides, the volume is packed with information to make buying and using products easier. The 2000+ page book also contains thousands of laboratory and industrial process offerings for fluid handling, water quality, research and biotech, and more. Many new technologies are featured, including Masterflex L/s precision modular drives which allow users to place the motor and controller where convenient, and Shuttle portable ultra-low freezer which provides energy-efficient ultra-low temperature storage anywhere. Also featured are the PH-1 module for the iPhone and iPad which can be used to convert the device into a pH meter, and the PBI shredder SG3 to safely and efficiently prepare samples for extraction of DNA, RNA, protein, mitochondria, and small molecules.